When you hear the name Gold Coast, you probably associate the destination with golden beaches, theme parks, and nightclubs. After recently living in Burleigh Heads for 18 months and going inland and exploring the Gold Coast Hinterland, I’m happy to report that there is plenty of GREEN behind the gold. What I have come to love about the Gold Coast region as it continues to evolve not only as a tourist destination but as a fantastic place to live, is its diversity, especially for families. We love the sand and surf and rollercoasters as much as anyone, but we also love a slower pace, getting back to nature and walks in the mountains. 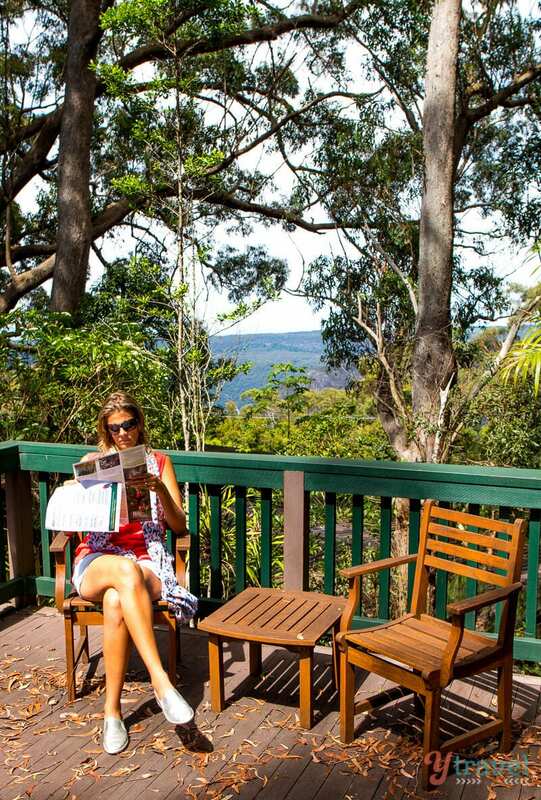 So once you’re done sunning yourself on a beach or scaring the wits out of yourself at a theme park, consider staying at one of these Gold Coast Hinterland accommodation options as part of your Gold Coast itinerary. I can assure you there’s a peacefulness there, stunning waterfalls and miles of hiking trails through the ancient forest. 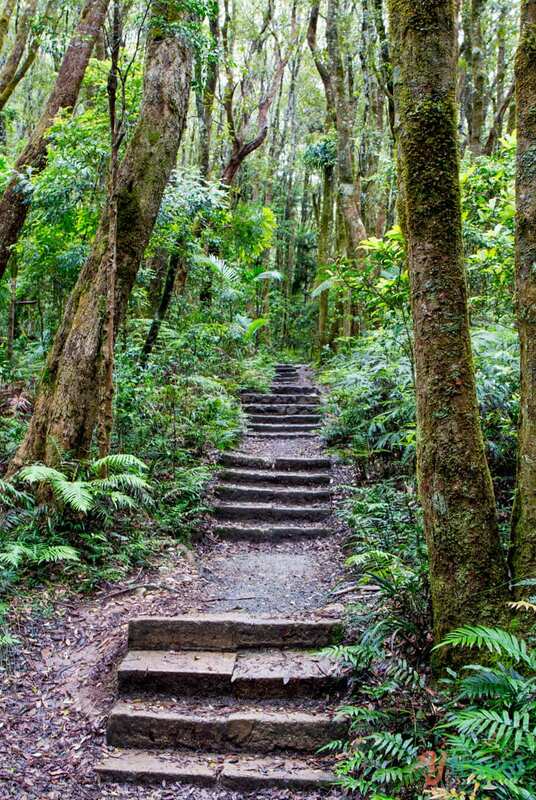 Located in World Heritage Lamington National Park, O’Reilly’s Rainforest Retreat is only a 90-minute drive west from the Gold Coast and a two-hour scenic drive from Brisbane. The latter section of the drive is rather windy with lots of turns, and I don’t recommend driving this part of the road after dark like we did. But, as we found out after staying for two nights at O Reilly’s retreat the drive is more than worth it. 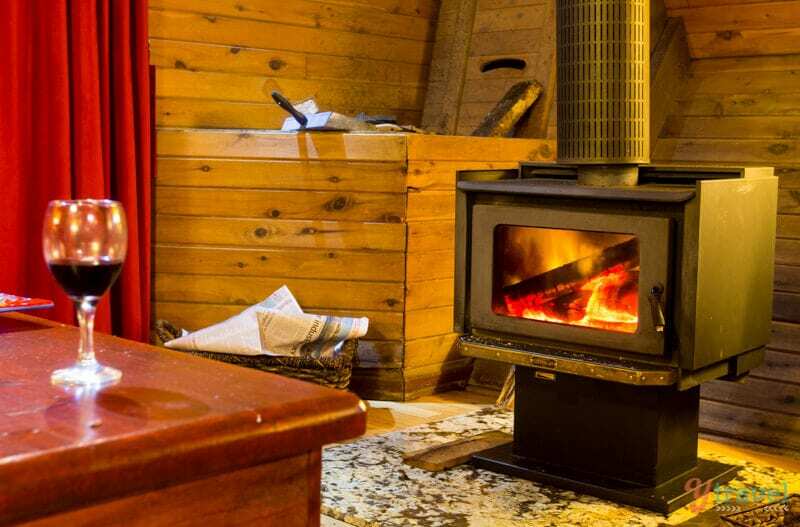 If you are looking for cozy and serviced Lamington National Park Accommodation to escape the chaos of the city and connect with nature and reconnect with family or friends, this setting won’t disappoint. Up here there are no traffic lights or high rises, only a lodge, rainforest retreats and luxurious Eco-Villas that blend into the rainforest setting. 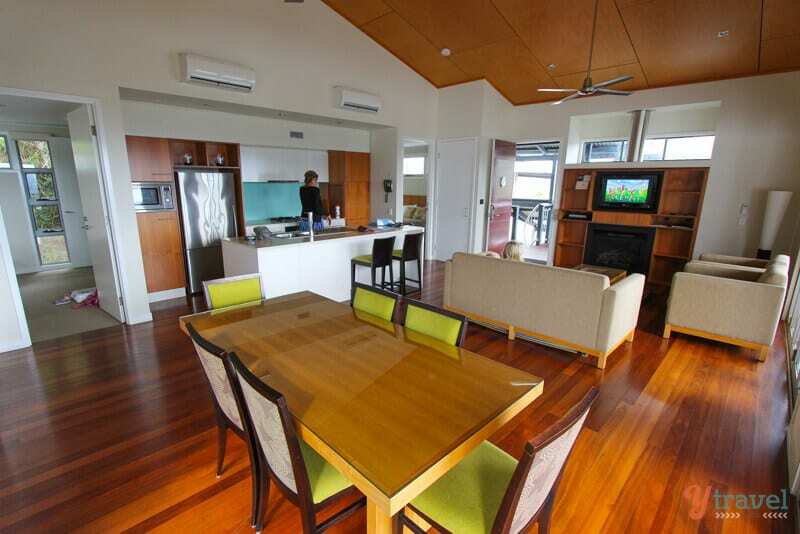 Accommodation at O’Reilly’s is modern, contemporary, spacious, and self-contained. We stayed in one of the Eco-Villas with stunning mountain views from our balcony, or through the glass fold-back doors when it got a little chilly – there’s also a gas fireplace in your rainforest villa to warm you up. And how could we so no to a spa bath on the balcony with a cold glass of wine after a fantastic day of exploring the rainforest? 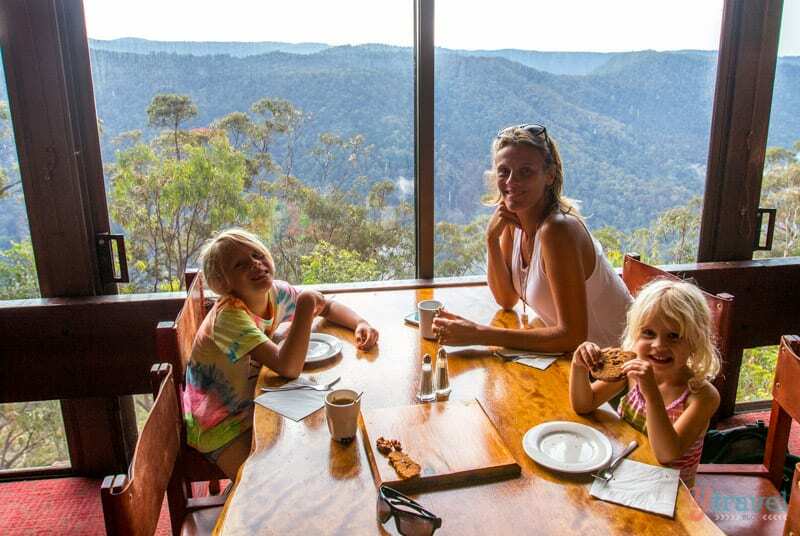 As far as Gold Coast Hinterland accommodation goes, a stay at O’Reilly’s is awe-inspiring and the perfect spot for a family getaway and to unplug from the normality of life! For some happy hour cocktails, we took in a lovely sunset at The Rainforest Bar. And followed that up with an exceptional dinner in The Dining Room which is opened for buffet breakfast and A la carte dinner. They have a good selection of wines including their own O’Reilly’s wines, and their pizzas are to die for! 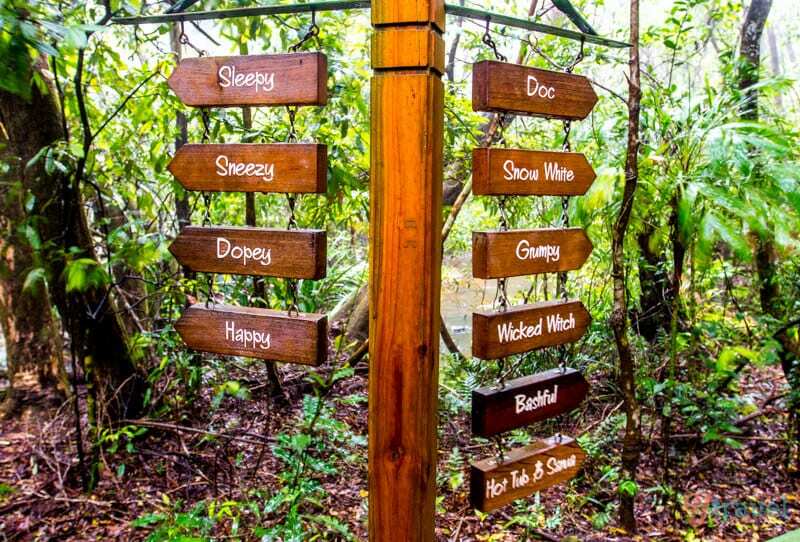 There’s an interesting story behind O Reilly’s rainforest retreat and the family who runs it. On the 19th February 1937, a Stinson Aliner crashed into the Lamington Ranges killing four of the seven passengers, and after a search failed to turn up any wreckage, a determined Bernard O’Reilly set out on foot to find the plane in the thick bush. Amazingly he found it along with two people still alive and in desperate need of medical help – they were rescued and survived. 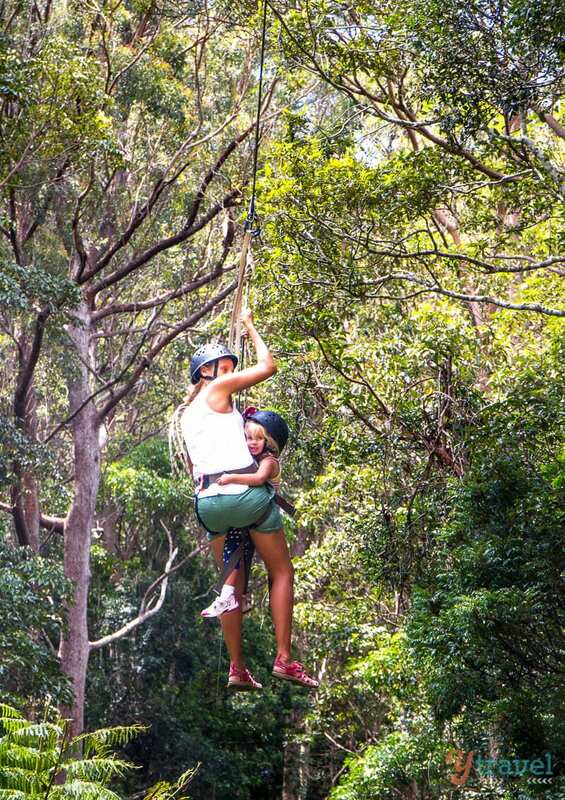 Since then three generations of the family have been welcoming people for over 90 years into O Reilly’s rainforest retreat and their beautiful backyard. 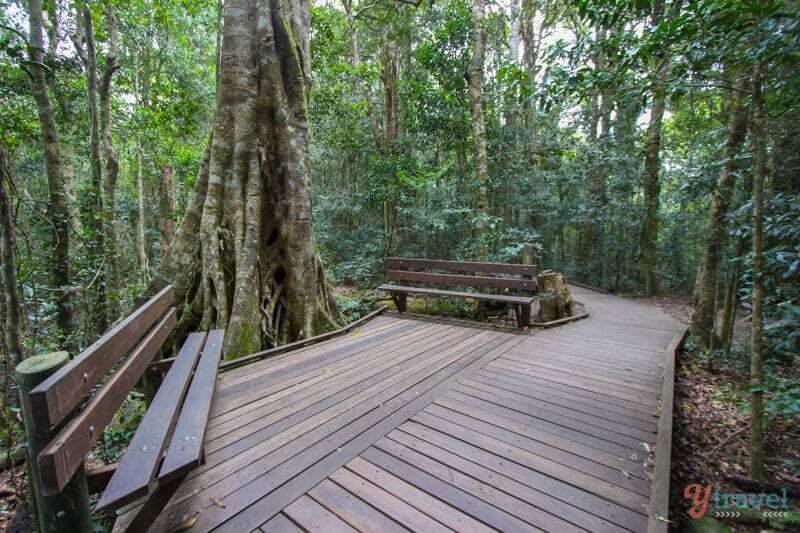 Lamington National Park contains over 160 km of graded walking paths that lead to lookouts, waterfalls and some of Queensland’s most significant wilderness. 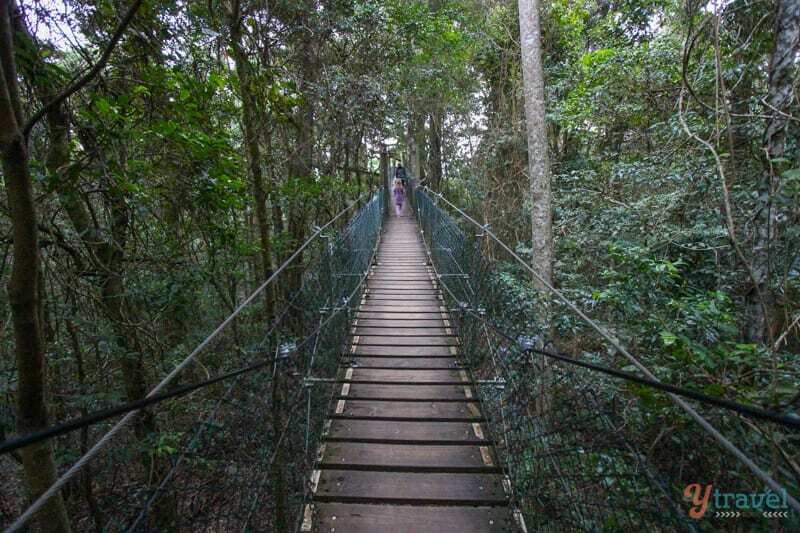 The lovely Tree Top Boardwalk, the first of its kind in Australia, is 180 meters in length and is made up of 9 suspension bridges, with much of the walkway being 15 meters above the ground. through a canopy of flowering and fruiting vine-covered trees. You can also follow in Bernard O’Reilly’s footsteps by following the 35km Stinson walk trail. O’Reilly’s offer guided hikes to the crash site. 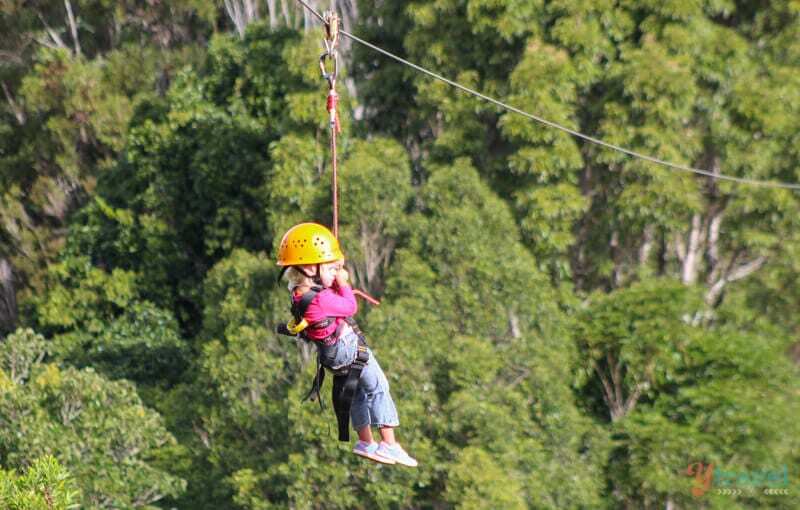 For a faster pace, suspend yourself 30 meters above the ground and zip along the 180-meter flying fox. Fun for the whole family. Yep, even our then two and a half year old faced her fears and took it on! If you’re a bird lover then you will love O’Reilly’s. 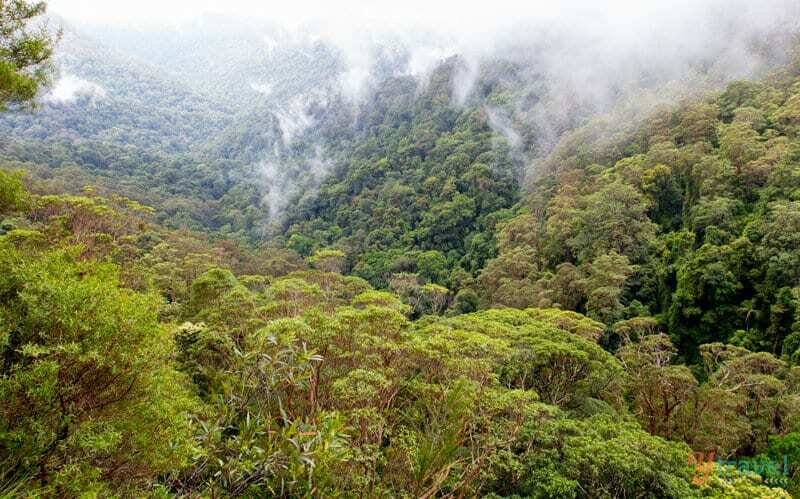 Lamington National Park is renowned as one of Australia’s premier birding areas with over 232 recorded species. 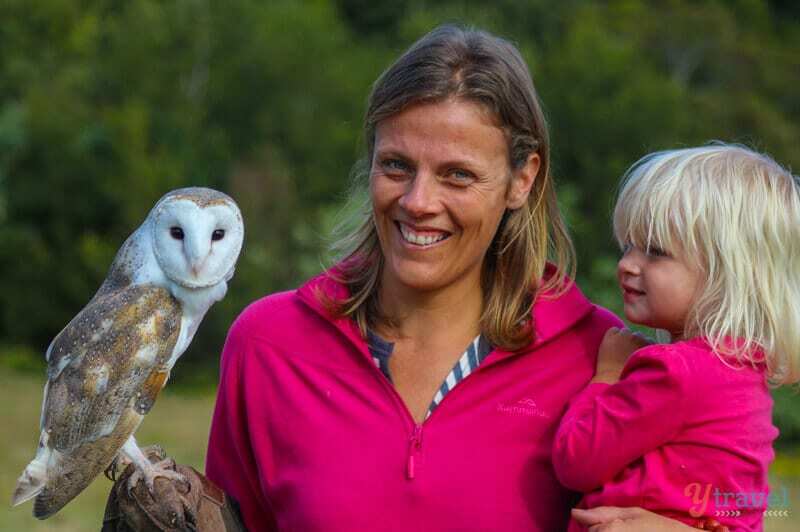 And the fantastic Birds of Prey Show was another highlight of our stay. 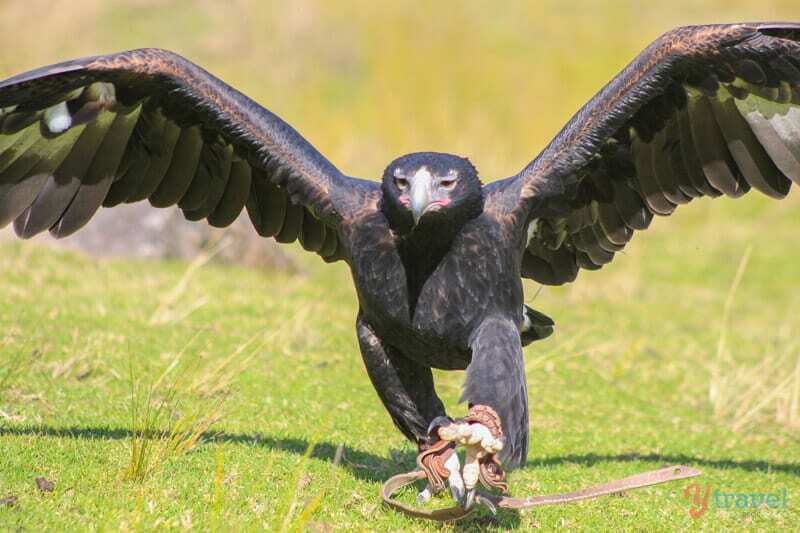 Getting so close to wedge-tailed eagles, barn owls, and kites and learning all about their skills as hunters and flyers was amazing! 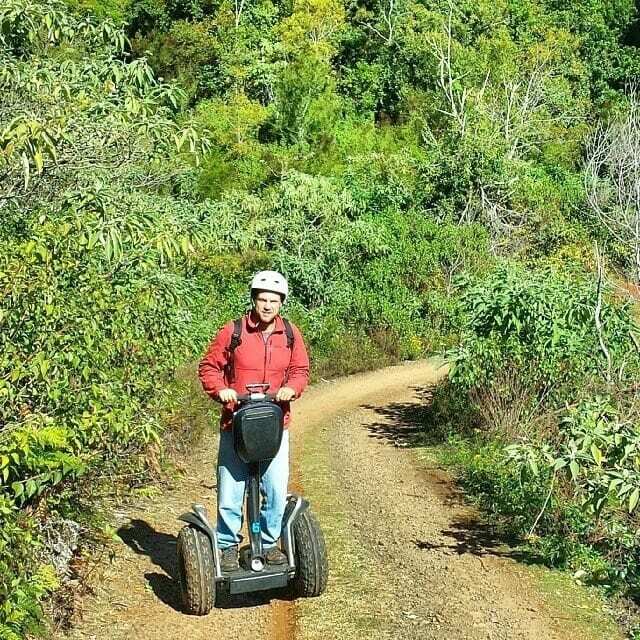 Walking in nature is not the only way to take in the national park, how about jumping on an eco-friendly four-wheel-drive Segway Safari and go cruising through the rainforest. 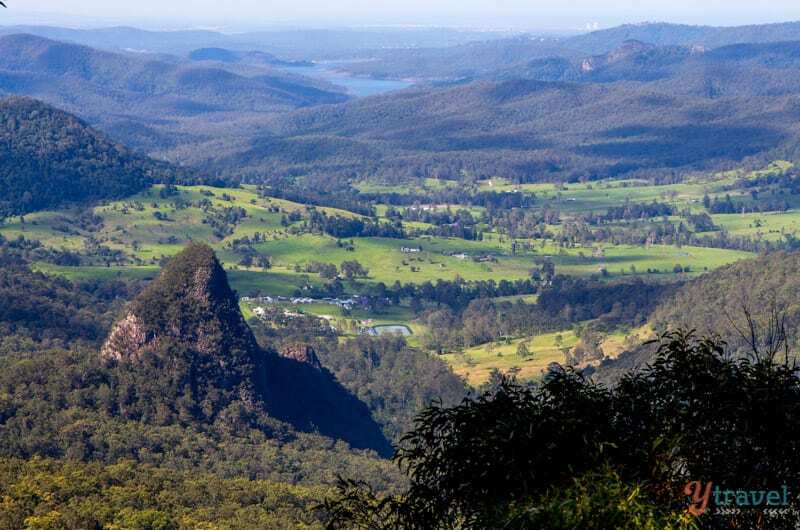 Yep, this part of The Gold Coast hinterland is something special. 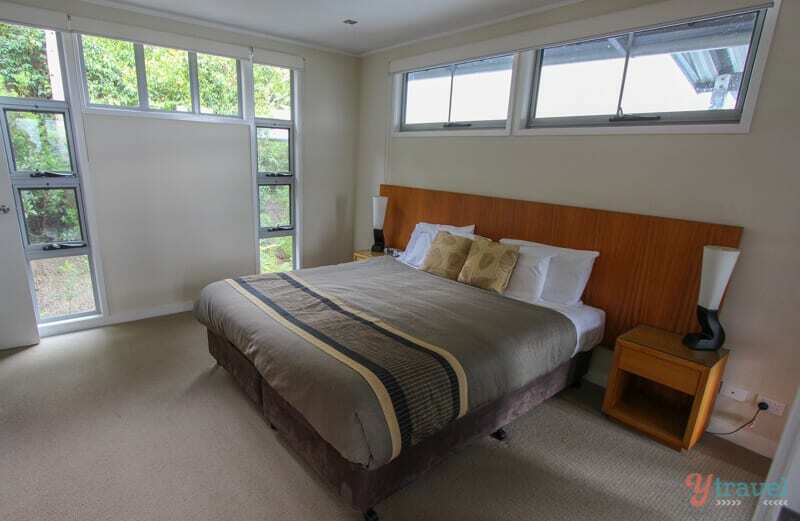 Accommodation – O’Reilly’s offers a range of options from the traditional charm of the retreat (formally the Guesthouse) or the modern self-contained eco villas. 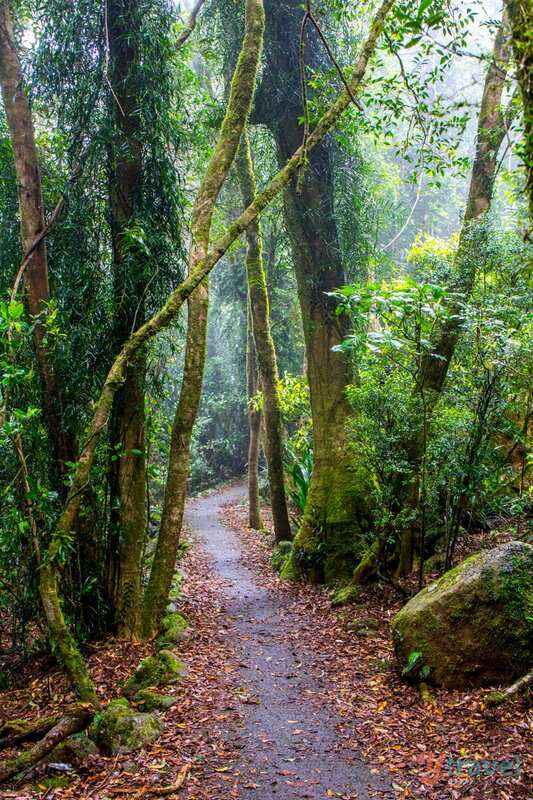 Another lovely spot in the Gold Coast Hinterland, and not far from our previous home on the Gold Coast at Burleigh Heads, is Springbrook National Park. And if you’re coming from Brisbane, it’s only an hour away! 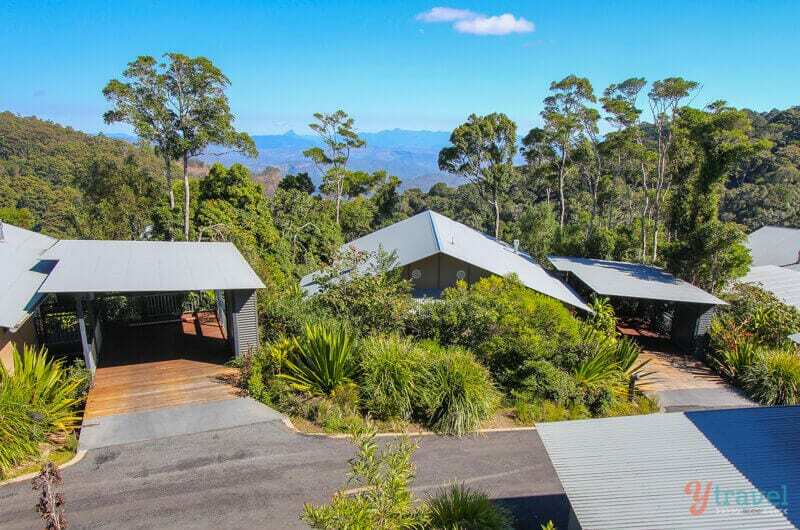 And the most enchanting Gold Coast Hinterland accommodation property we have stayed in is located within Springbrook – The Mouse House Rainforest Retreat. 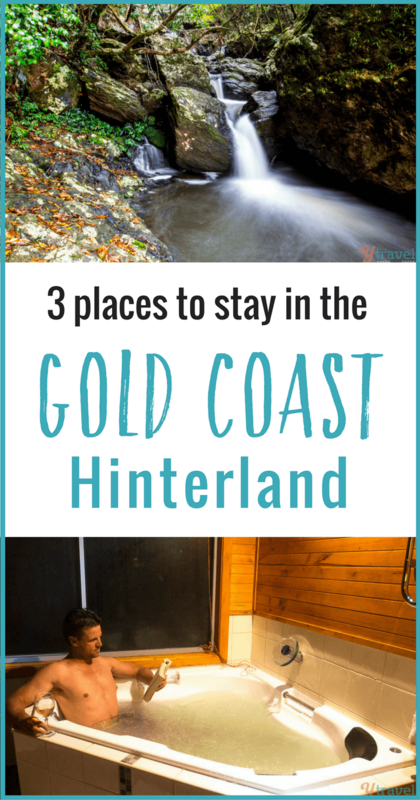 Whilst it did rain for most of our time in Springbrook National Park, the wet weather allowed us to really get cozy and enjoy this unique Gold Coast Hinterland accommodation and all it has to offer. The Mouse House truly makes you feel like you’re in another world. 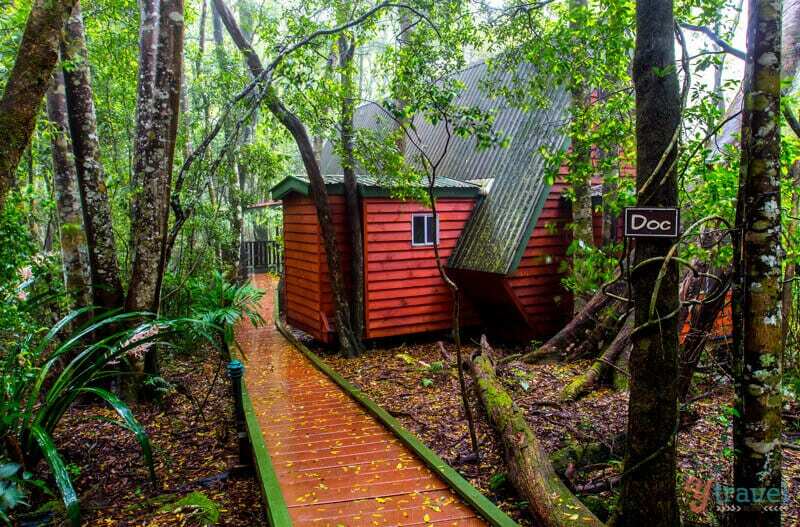 This Springbrook accommodation consists of a series of 12 A-frame cedar wood chalets named after the seven dwarfs that are nestled throughout the World Heritage Listed rainforest. 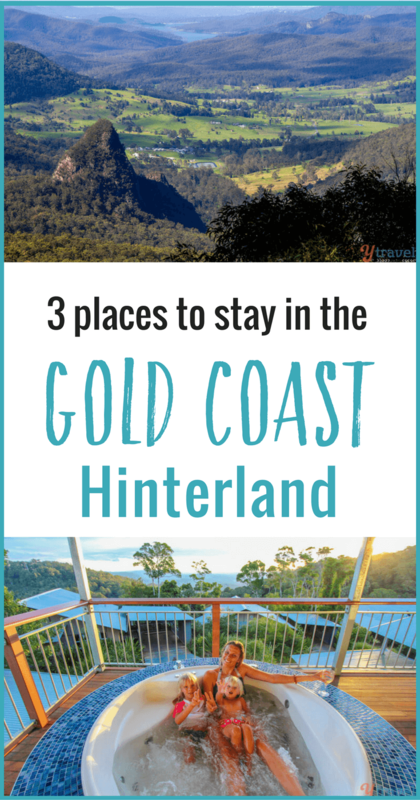 We stayed in Doc, which could comfortably sleep up to 8 people so if you’ve got a large family or friends who want to experience a rainforest retreat on the Gold Coast bring them along and share the cost! 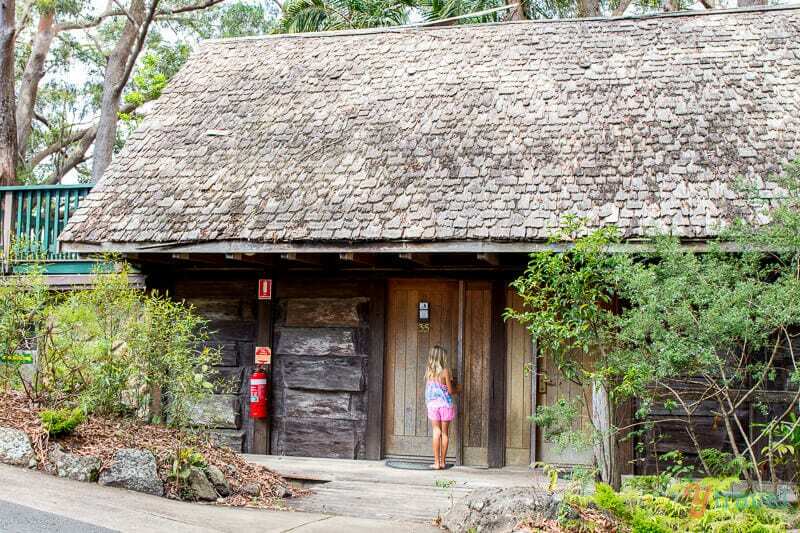 As we walked through the misty rainforest to uncover these Springbrook chalets hidden behind twisted vines, our kids felt like they were a part of the Snow White storybook discovering the Seven Dwarfs Cabins. In front of our Doc chalet was a picturesque stream which added to the mood and serenity, and if it’s sunny when you visit, a BBQ on the covered patio overlooking the beautiful rainforest would be idyllic. 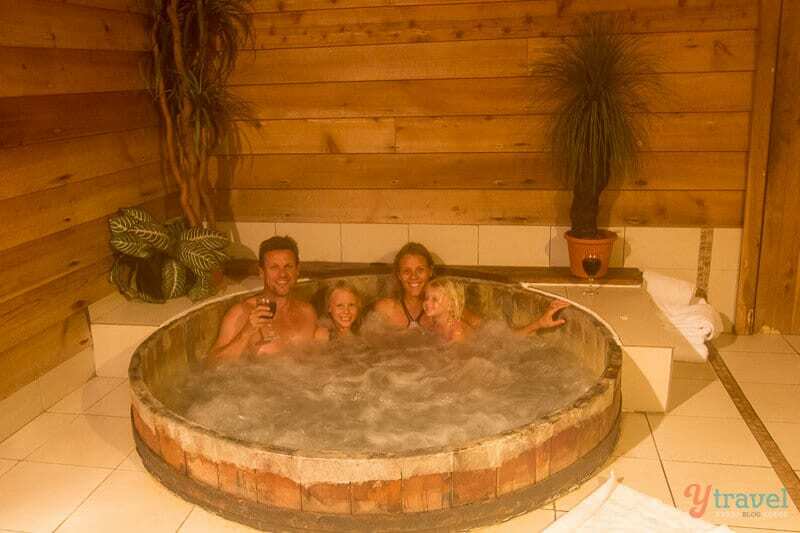 There’s an on-site indoor hot tub that was just perfect for us in the conditions, and for you after a day of hiking, and we made the most of our in room spa bath later on in the evening! 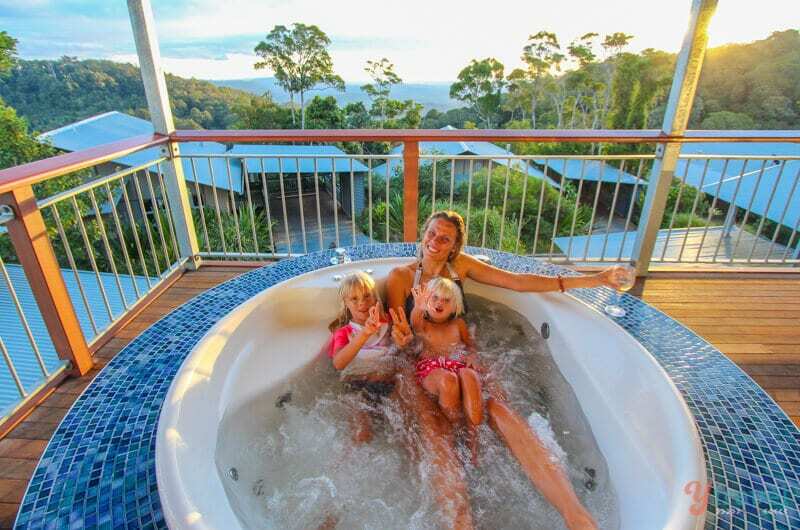 As a busy family, it’s not often we get to soak in a hot tub, in a rainforest, and read a book with a glass of vino – this is what you get at the Mouse House rainforest retreat. 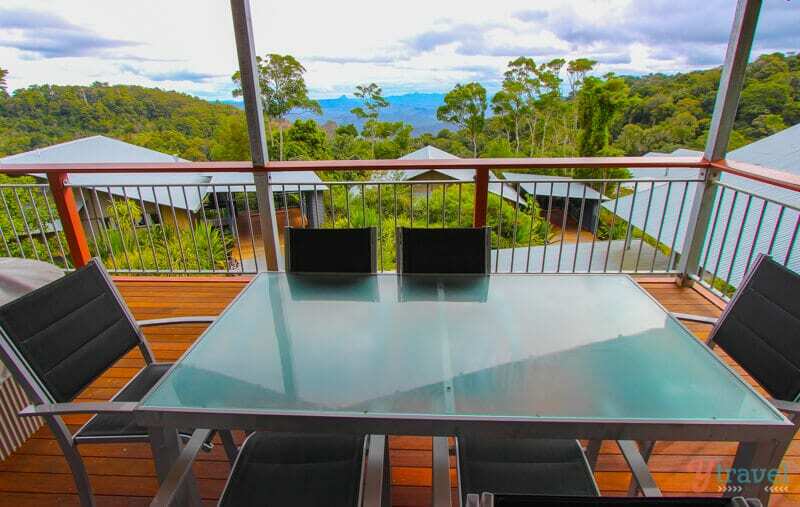 Mouses House Rainforest Retreat is only 30 mins from the coast, or an hour from Brisbane, and is right near the Twin Falls Circuit and conveniently placed to explore the best of Springbrook National Park. 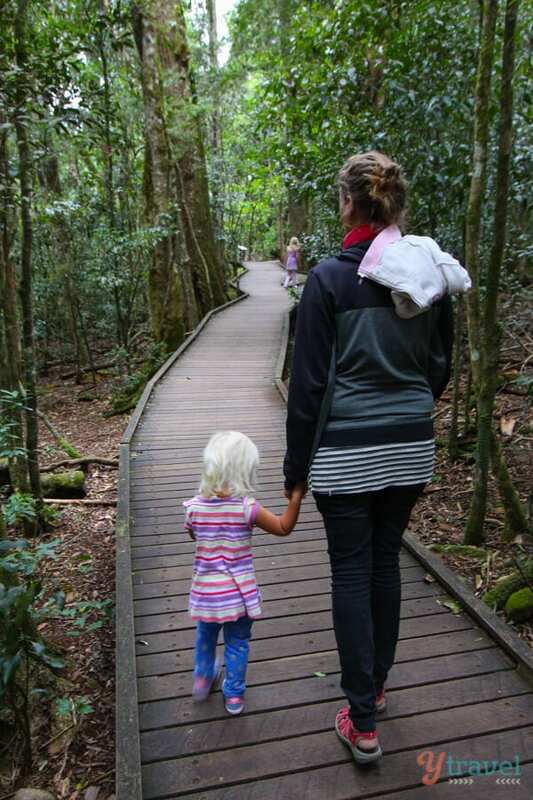 Despite the weather, we did manage to do two walks during our stay at the Mouses House Rainforest Retreat, and Springbrook National Park offers a wide range of walking opportunities from 300m to 54km in length. 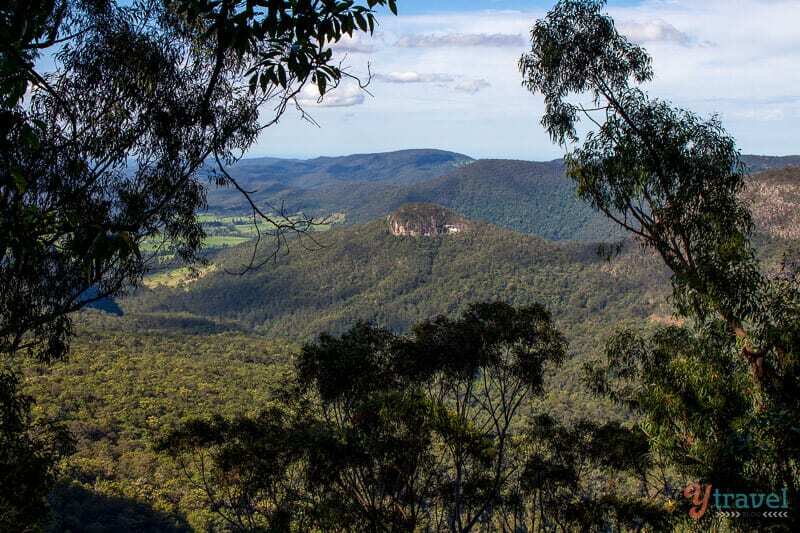 The 4-kilometre Twin Falls Circuit starts from either the Tallanbana Picnic Area or Canyon Lookout, and you simply follow the track in an anti-clockwise direction. 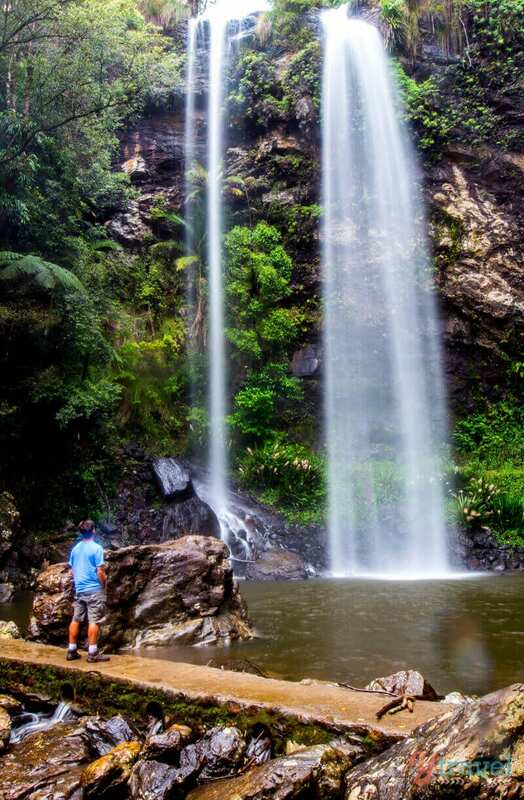 It’s one of the most popular Gold Coast Hinterland walks to one of the best Gold Coast Hinterland waterfalls! And Canyon Lookout is an easy 30m stumble from the car park and you get spectacular views from Canyon Lookout over the sheer walls of The Canyon. 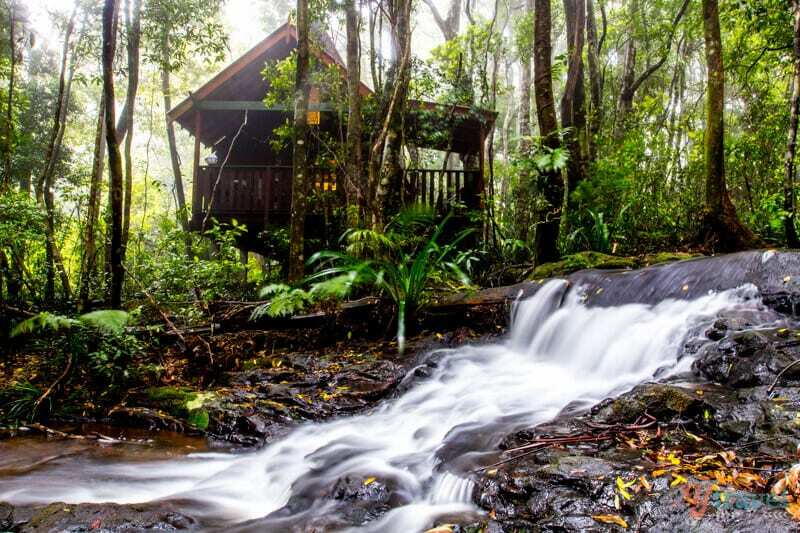 Accommodation – all chalets at the Mouse House Retreat are fully self-contained and unique and beautifully appointed with stunning surrounds amongst the rainforest. 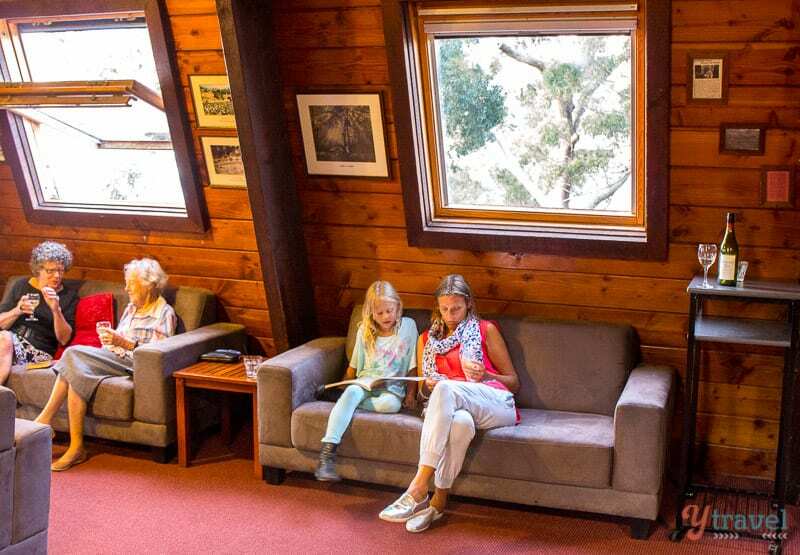 Another Gold Coast Hinterland accommodation option is the Binna Burra Mountain Lodge – a place to stay and activity centre all-in-one. 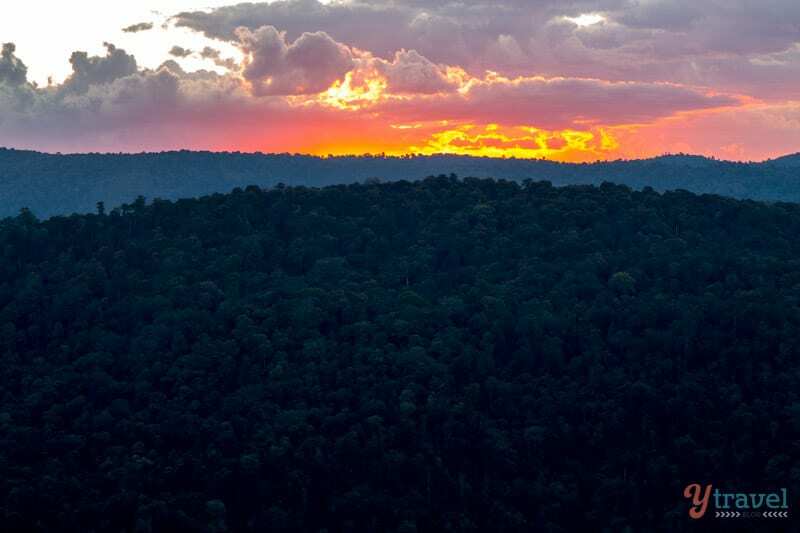 This UNESCO World Heritage listed area comprises Australia’s largest remnant of sub-tropical rainforest and has been welcoming guests since the early 1930s. 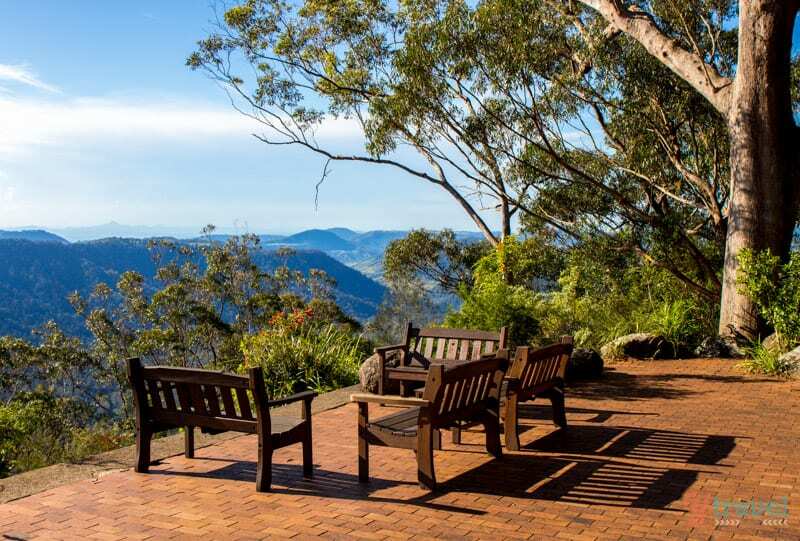 If a mountain getaway to unplug is what you’re looking for, this Binna Burra National Park accommodation could more than meet your needs. Depending on your cabin of choice, there could be no televisions or clocks, and we didn’t even have phone service in our cabin which normally would stress us out running our online business, but it was such a nice change from the constant temptation to be connected to the online world (we could get phone service up at the main reception building). Otherwise, the character filled cabins aren’t lacking in modern amenities, and when we checked into our cabin the kids excitedly raced upstairs to their loft bedroom, which would become their cozy little sanctuary. We had a small deck to sit out on in the afternoon sun with bush and valley views, and this getaway was all about connecting with nature and each other as a family. Upstairs of the main residence is the library which hosted afternoon wine and cheese time. Which was perfect for us as the kids occupied themselves reading whilst we enjoyed 20 minutes of downtime and views over the valley. A hearty buffet breakfast was served each morning in the Clifftop Dining Room with stunning views over the Coomera Valley. And at 4 pm daily we enjoyed afternoon tea in the Clifftop restaurant, whilst the girls enjoyed a hot chocolate and a cookie and chatting about our hiking adventures during the day. Just outside the restaurant in the landscaped garden area is the perfect spot to take in the sunset, whilst you kick back on one of the chairs with a cold drink and spectacular views. 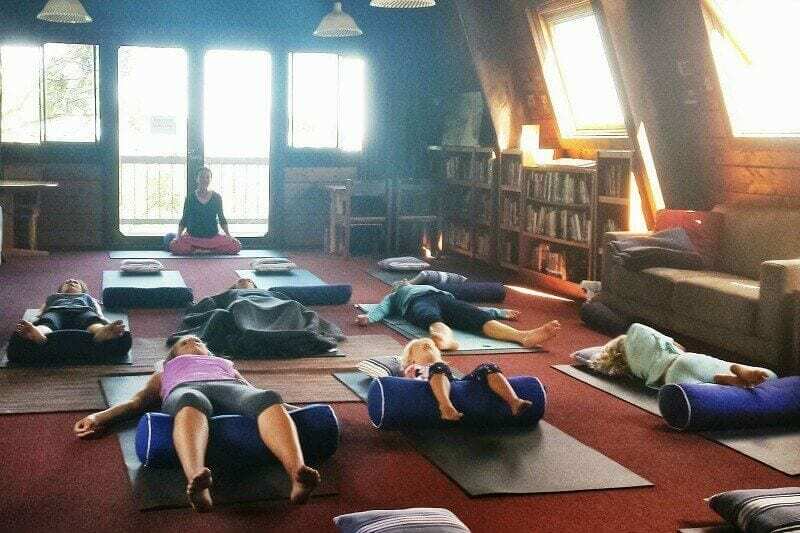 If you’re into yoga like Caz, they had a pre-breakfast morning yoga session up in the library room, and if your kids are early risers they are also welcome to join in for the session. 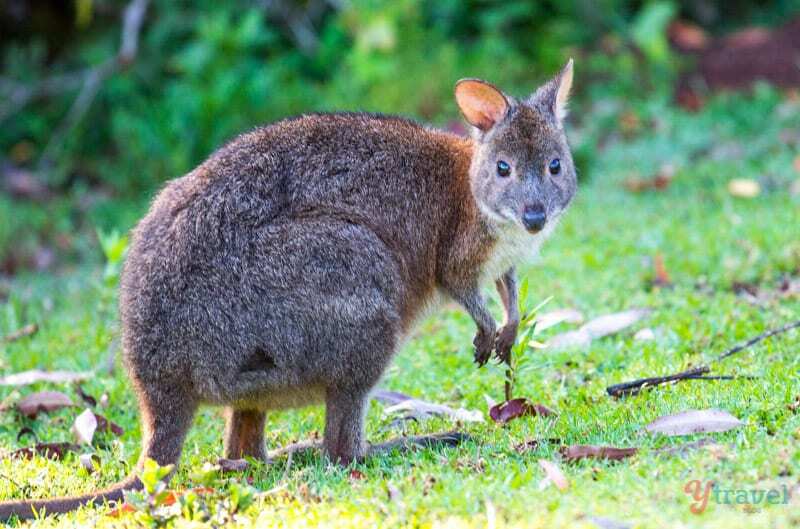 And getting up early is also the best time to spot one of the locals hopping about at Binna Burra, the cute Pademelons. 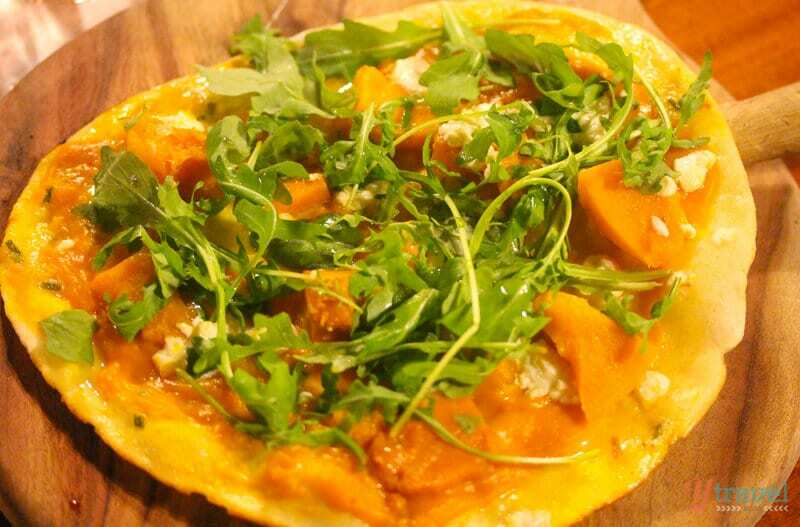 Looking to bring out your inner Robin Hood? 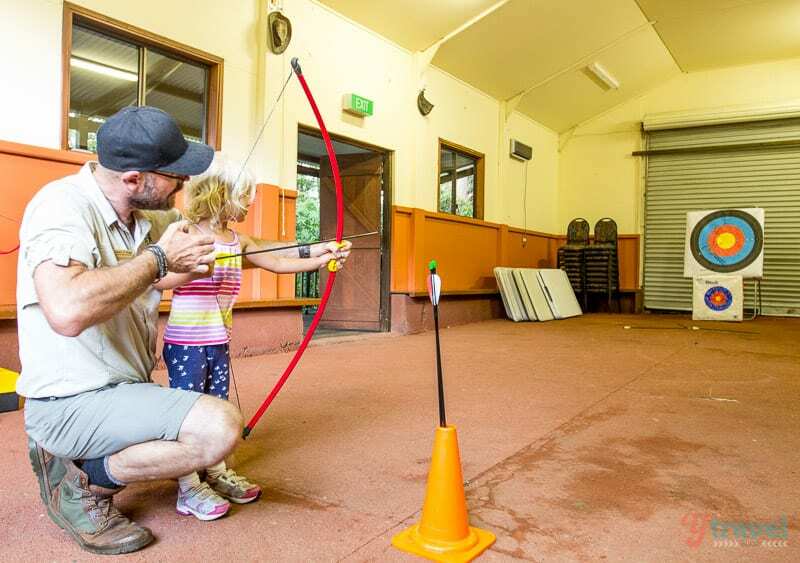 One of the cool activities at Binna Burra Lodge is archery which our kids loved and it was fun learning about this medieval sport. 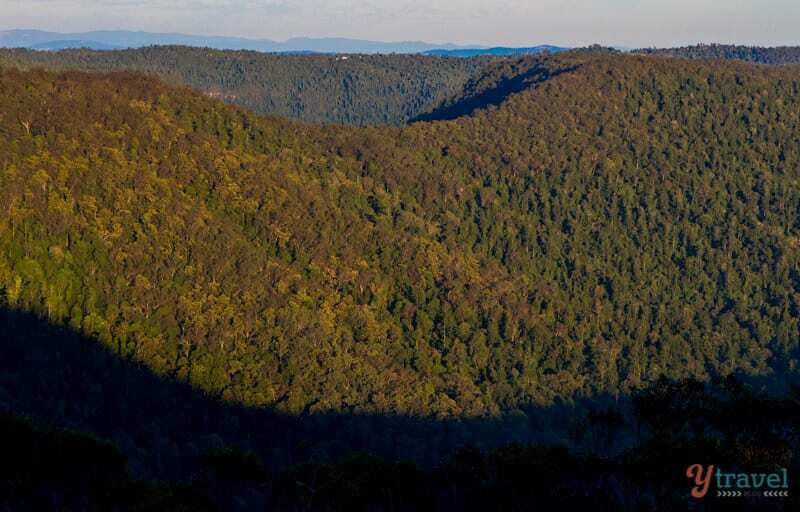 The gentle one hour Bellbird Lookout Walk takes you through the rainforest and eucalypt woodland and ends with stunning views over Ship’s Stern, Egg Rock, Turtle Rock and the Numinbah Valley. 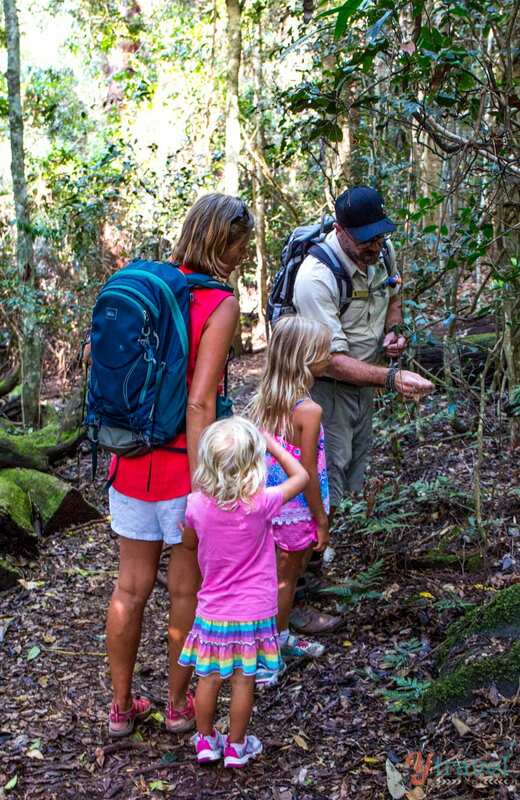 If you have young kids and are looking for some short Binna Burra walks, this one is perfect. 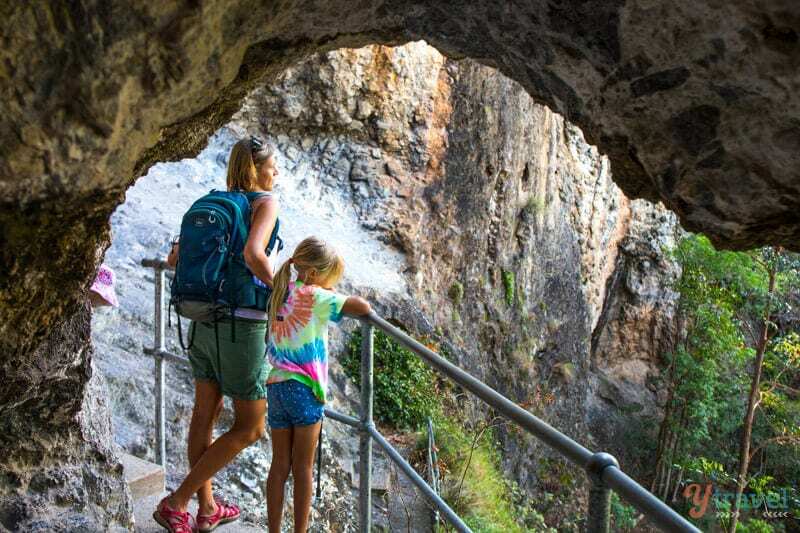 The 5-kilometre return Caves Circuit Walk is also family friendly and you can check out the display of volcanic rock built up by the Mt Warning volcano. A nice spot to relax for lunch is at the Lamington Teahouse Cafe. 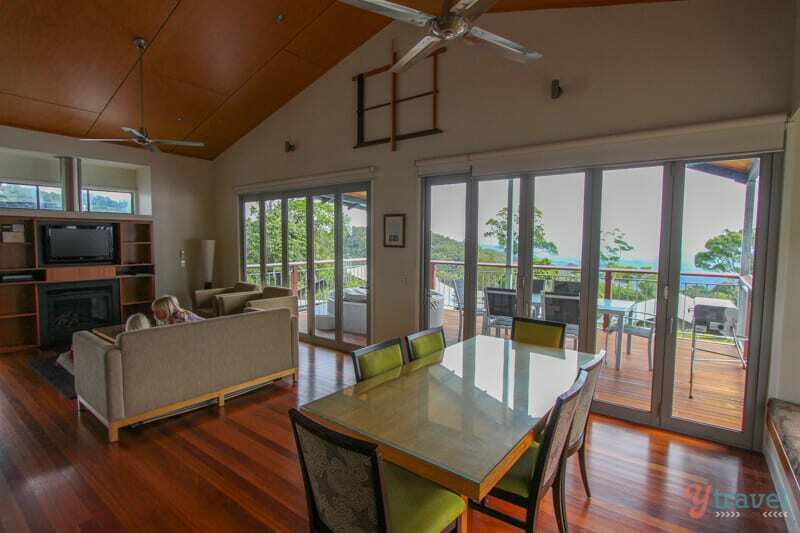 Grab a seat by the window if you can as the views over the Numinbah Valley go on forever. Just like at O’Reilly’s, there’s a cool flying fox here. 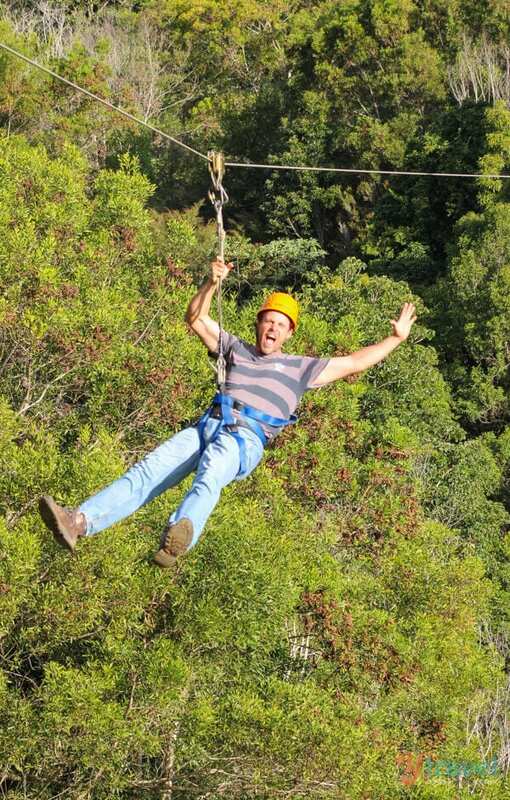 This one is 165-metres long through the treetops and this time we could go tandem. 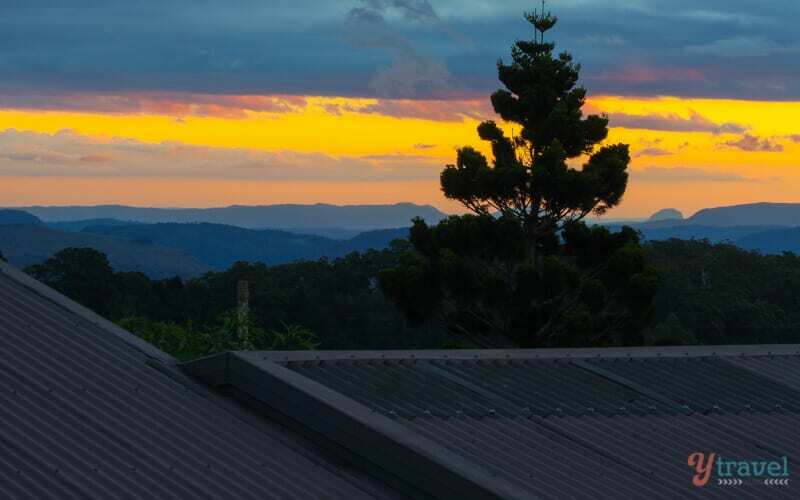 To get to your Binna Burra accommodation from the Gold Coast is a 60-minute drive, and if you’re leaving from Brisbane it will take you approximately 90-minutes. Getting there – If traveling on the Pacific Motorway M1, take the Nerang turn-off (exit 69 Southbound or exit 73 Northbound) and follow the signs Nerang West/Binna Burra. Take the turn off to Beechmont and head straight up the mountain. 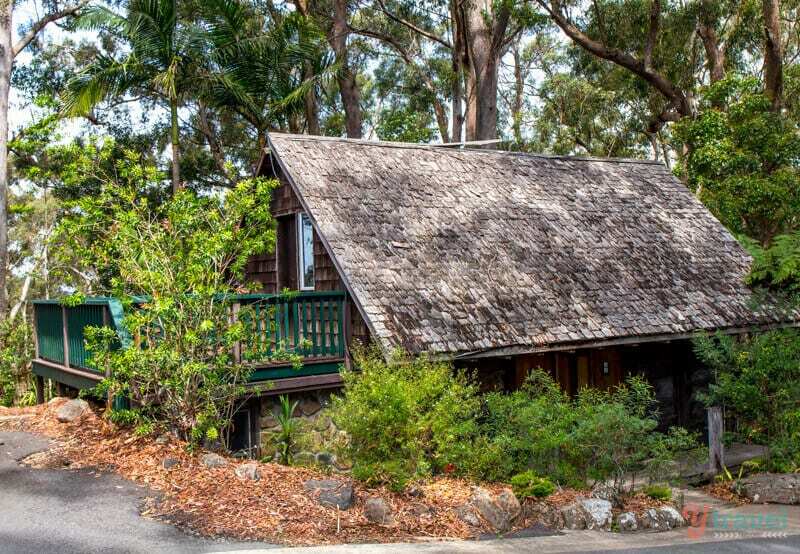 Accommodation – Binna Burra Lodge has four types of accommodation options from lodges to cottages to campsites. Looks lovely! We’re in the process of booking a trip to Northern Wales in the spring with friends and this seems like a great place to stay where we can have our own space, but also have communal space as well! Congrats on five years! As someone who is just starting my first year of full-time freelance writing, that is no small feat 🙂 It can be hard to see the payoff (especially in the beginning), but it’s definitely worth the flexibility in the end. Don’t know where you were – in parts of Asia (Hong Kong and Singapore) not queuing correctly can result in bodily harm! Very good list. I’m sending it off to friends of mine who are traveling through Cambodia, Lagos and Vietnam for 3 months!